← The Best Media on the US Government… isn’t in the USA? Kim Jong-un is talking to his citizens, not the USA. This post contains mostly commentary and speculation. More and more, I’m becoming convinced that North Korean supreme leader Kim Jong-un is not talking to the United States or to South Korea. He’s speaking to his own people. 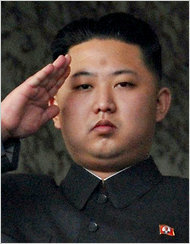 One thing Kim Jong-un lacked was the cult of personality his father had. Indeed, for a number of years after the death of the “Eternal President” Kim Il-Sung, Kim Jong-Il was absent from the media for several years, making no appearances his first years in office as the dictator of North Korea. However, almost immediately after his “coming out party” in North Korea, no doubt to get him cemented into the North Korean People‘s ethos of acceptable leaders — Kim Jong-un has been all over the media. Was this a panicked attempt to cement his image into the minds of North Koreans, knowing their ailing Supreme Leader‘s time on Earth was borrowed time? Or was this part of a plan already in motion to get him in the public eye, and the elder Kim’s demise shortly after was just coincidence? Because he has both a lack of military experience, save his rank of Wonsu (Marshal or “Generalissimo” ) in the [North] Korean People’s Army that he was gifted by his father the year before his demise, and a lack of time in an actual government position, his acceptability by the people I think is a major concern. Back to the original point, I’m thinking more and more this is the younger Kim’s attempt to call a “Rally Around The Flag.” While I’ve always compared the nation of North Korea to the state-equivalent of a paranoid-schizophrenic; and while Kim Jong-un’s lack of experience with the United States and the outside world first-hand that his Father and Father before him had concerns me — the more I hear, the more I’m convinced he isn’t talking to South Korea… or the USA. He’s talking to his people. He’s trying to get North Korea to not only accept him, but be “with” him. Does he, in his ignorance, know the level of “most dangerous game” he’s playing?